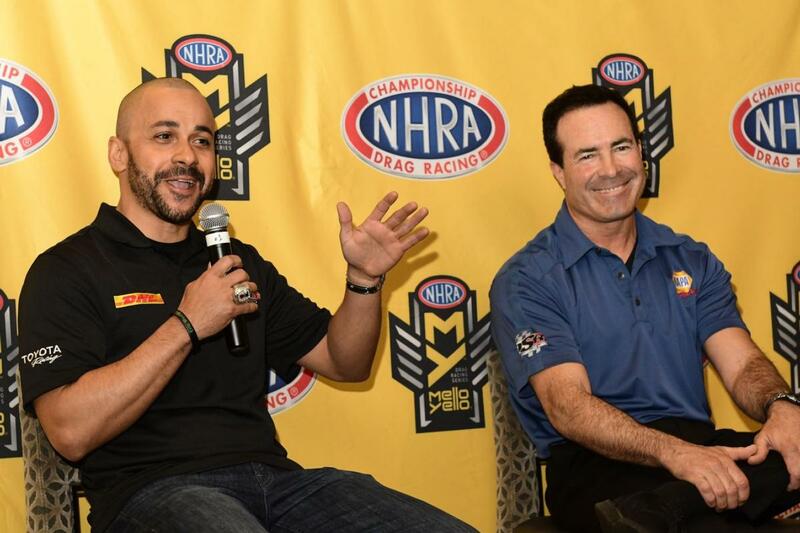 NHRA stars meeting with the media at the official DENSO Spark Plugs NHRA Four-Wide Nationals press conference on Thursday were optimistic and ready for the three-day event to begin at The Strip at Las Vegas Motor Speedway. World Champions Jeg Coughlin Jr., Angelle Sampey, Ron Capps, Brittany Force, J.R. Todd, Bo Butner and Matt Smith were joined by NHRA Top Fuel rookie Austin Prock at Del Frisco's Double Eagle Steakhouse to promote the 20th annual event, which runs Friday through Sunday. 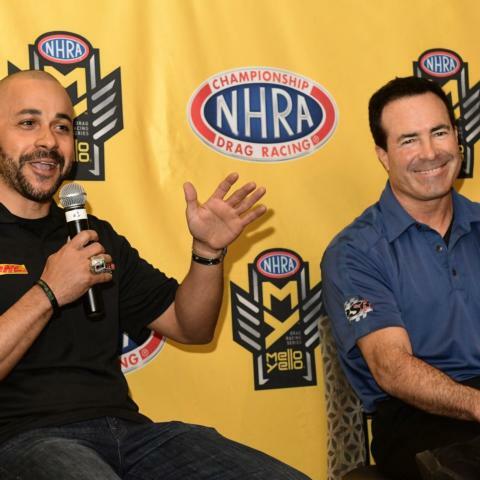 The drivers and riders are excited and primed for the four-wide extravaganza, which is one of only two four-wide NHRA national events they will see this season. "I'm really excited coming here for four-wide this week," said Coughlin, a five-time world champion in the Pro Stock division. "We've got a really fast-running Chevy Camaro right now, and we won the second event of the season in Phoenix. I'm ready to get behind the wheel and get to work this weekend. "We're always treated to first-class amenities at The Strip, and it's going to be a great weekend. The Pro Stock contingent is really good right now, and it's going to be great side-by-side racing." For Force, the 2017 Top Fuel world champion, four-wide racing is a different ballgame, but an experience she enjoys in Las Vegas in the spring time. "Four-wide is crazy, it's nuts," Force said. "If you thought the ground shook with just two Top Fuel cars going down the track, well, come check out four-wide because it's insane. Conditions look great this weekend, and all four lanes look awesome. "So, it looks like it's going to be a good weekend, and we're hoping for a long weekend." Gates open for spectators each day at 7:30 a.m., with sportsman class racing beginning at 8 a.m. The event will be televised on FS1 from 6:30-8 p.m. on Friday and from 8:30-9:30 a.m. and 3:30-5:30 p.m. on Sunday. For tickets to any events at The Strip at LVMS, log on to LVMS.com or call 1-800-644-4444. Every ticket is a pit pass, and children 12 and under get in free to the general admission areas with a ticketed adult.